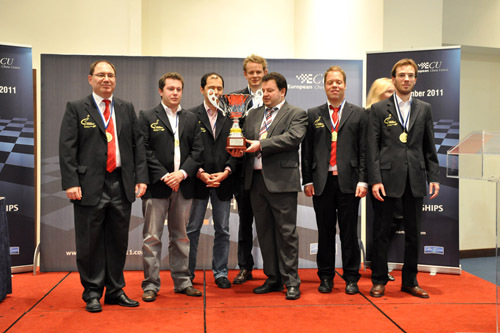 The European Team Chess Championships will run from 3-11 November 2011 in Halkidiki, Greece. This year will be the 18th edition of the championships, which have become a major event in the chess calendar. 30 players rated over 2700 Elo will be playing. 38 National teams will be taking part in the Open event, and 28 in the separate women’s event. Each team consists of 4 players and a reserve. The event format for both the Open and women’s competitions is a 9-round Swiss, with time controls of 40 moves in 90 minutes followed by 30 minutes to finish, with a 30 second increment from the start of the game. The rounds start each day at 15:00 local time (13:00 UTC) except the final round which is 2 hours earlier. Live games will be available at the official website. The European Team Championship (often abbreviated in texts and games databases as ETC) is an international team chess event, eligible for the participation of European nations whose chess federations are located in zones 1.1 to 1.9. This more or less accords with the wider definition of Europe used in other events such as the Eurovision Song Contest and includes Israel, Russia and the former Soviet States. The competition is run under the auspices of the European Chess Union (ECU).